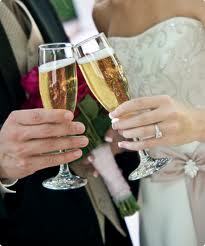 As you plan your reception, there are some things you will need whether you are planning a small or large reception. Every reception includes tables and chairs and most include some type of meal. Many couple use wedding place cards so guests know where they are to sit. Some couples use place cards to label the main tables reserved for the wedding party and families. There are no rules for using place cards making it easy for couples to use them in any way they prefer. You can use simple table cards or name cards for each guest at your reception. Some couples place name cards for each guest while others let guests find their name card. One idea for your place cards is to print them on your home computer using different colors of paper. You can find cardstock in a variety of colors at craft stores such as Hobby Lobby. 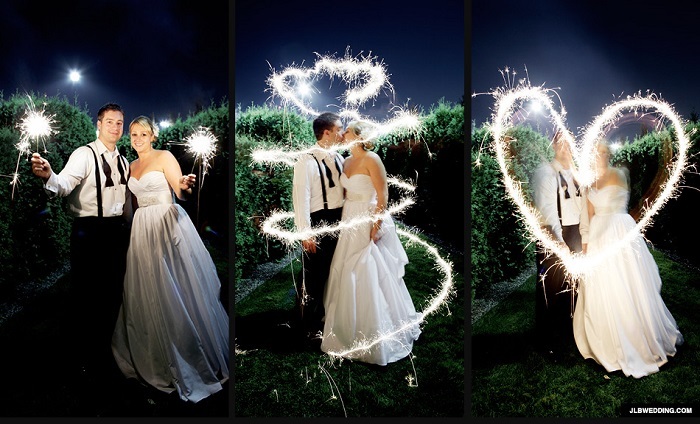 Find colors that match your wedding theme and use different shades of those colors. 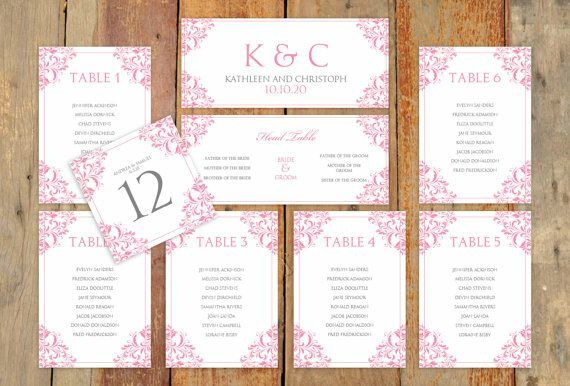 You can use a decorative font for printing the names or table numbers on your cards as well as a decorative border. 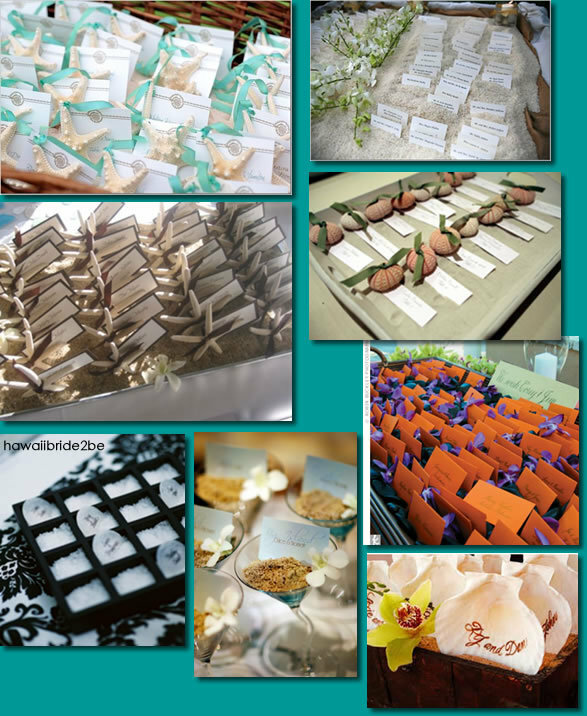 One way to add an elegant look to place cards is by adding a ribbon to each one. You can use ribbon that matches or contrasts the color of the cardstock. Ribbons can be glued to the card using a hot glue gun or craft glue. Ribbon and glue are available at many stores that sell craft items. Small silk flowers add a unique look to your place cards. You can use craft glue to attach small flowers to the side of the card. The flowers can be an assortment of colors or a specific color for each table. Your cards will have a spring look to them when you add small flowers for decoration. Another fun ides for the cards for your reception tables is to use a unique shape for each one. One way of doing this is by using number shapes with names written on them. The number would correspond with the table for the named person. Other fun shape ideas include flip flops for beach themed weddings and luggage tag shapes for destination weddings. One cute idea that makes it easy for guests to find their seat is by hanging the cards on the chair. A piece of ribbon tied to the card allows you to hang it on the chair. Gluing the ribbon to the card will also work . As guests walk through the reception area, they will be able to find their name. Guests are able to socialize as they look for the chair with their card. One way to display name cards on the tables is by attaching them to an item such as an apple. Another idea is to use small pumpkins for fall weddings. Pine cones are another item you can attach the card to when placing it on the table. Depending on the theme of your wedding, you can choose an item that matches such as a candy cane for a Christmas wedding. You can place the items with the cards at the guests place setting. Your guests will be able to locate their seat as they walk around the reception area. 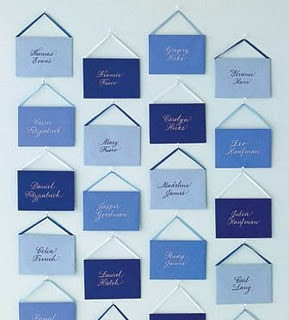 Many couples choose to place a large covered board at the entrance to the reception and hang place cards on the board. This is a way to display the cards for guests to easily see. 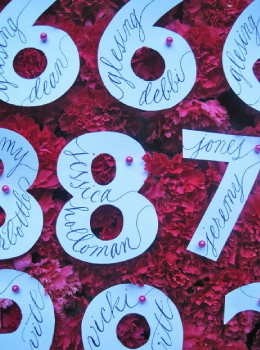 With cards hung on a board, several guests will be able to look at the names at the same time. Guests will be able to locate their name without having to bend over and stoop. You an arrange the cards nicely on a covered board with pins. By placing the cards in the fork at the place the person will sit is one idea for the place cards. They fit securely in the tines of the fork for each guest. Guests will be able to look at each table to find their card. As they circulate the reception area, they will be able to visit as they look for their name card. Some couples place a table near the entrance to the reception area for the cards. The place cards are displayed for guests to locate their name. You can arrange the cards in rows alphabetically making it easy for guests to locate the card with their name and table. You can use one or more card tables covered with a cloth for this purpose.